Motorsports can be expensive but it is not as expensive as most people think. There are ways to get involved very cheaply including: volunteering your time, autocross, track days in your own car, time trails, karting and amateur racing. For club racing a "Spec" class like Spec Racer Ford is a more affordable option as there are limitations on the modifications that can be made and the equipment is standard amongst all race cars, including: chassis, suspension, engine and transmission. In the Spec Racer Ford class, spending the most money doesn't mean you will be at the front of the field. It really comes down to driver skill and car preparation. This has made Spec Racer Ford one of the most competitive classes with large fields of cars at most SCCA races. Most people want to know the costs up front. The costs for every race series is different and you can spend as much as you want. These summary costs below should give you a rough guide based on our experience with SCCA club racing in the Spec Racer Ford. There are always unforeseen costs (i.e crash damage) and little items that add up but for the most part we have tried to outline common costs that you can account for when racing. Further down we break out the costs with more details and information to help you understand the specific items including racing license, driver gear, race weekend and maintenance costs. Each season you need to renew your club membership (~$100) and license (~$100); you can get a discount sometimes for multi-year membership. To keep you license current in SCCA, you have to race at least two race weekends, but these rules change from time to time. Check the General Competition Rules (GCR) for the latest SCCA rules. At a minimum you will need the following safety gear to go racing, expect to spend between $1500 to $5000 depending on the manufacturer brand. I highly recommend going to a store like Wine Country Motor Sports where you can try things on, I was amazed how different helmets and race suits all fit even from the same manufacturer. I initially spent about $2500 on mid range equipment when getting started. I have since added additional gear with the help of our sponsors. These are the general cost for a race weekend based on experience, accommodation and consumables, I tend to be conservative in my estimates, your mileage may vary. Tyres last about 10-12 heat cycles or sessions. The great thing with the new Hoosiers are their performance continues and there are no magic cycles so you can drive them until they wear out. You can get a couple of double race weekends out of a set or a test day and a double race weekend. Don't forget mounting and balance a full set of tyres with mount, balance, disposal fees, wheel weights and valve stems if you need them will run ~$1000. The Spec Racer Ford Gen3 uses a 80/20 mix of 91 / 100 octane fuel and the Gen2 uses a 50/50 mix. Fuel consumption is about ~1 gallon per 10 minutes of runtime at race pace. In a typical double race weekend with a test day expect to use ~25 gallons at ~$5-6 per gallon expect to spend ~$150 on fuel. Accommodation costs will depend on your level of comfort and the location of the track with the more remote tracks being generally cheaper. I typically stay at cheaper hotels with costs ranging from $50-$70 per night depending on location and taxes. The other option is to camp at the track or sleep in your trailer. Your food costs will depend on your tastes, food at most club tracks is reasonably priced. Generally budget $1000-$1200 per day for a Spec Racer Ford and $1500 per day for SRF Gen3 perhaps decreasing by a few hundred dollars for consecutive days. Renting is a cost effective way of trying out a racecar before you decided to purchase. Rental costs can vary depending on the shop. Typically rental costs cover everything related to the car, car preparation, transportation/towing, track side support, fuel, used tyres and maintenance items. Rental costs often excludes crash damage, driver gear, entry fees, membership and license, accommodation and food. Buying a Spec Racer Ford is relatively straight forward there are approximately 900 cars out there. You can buy a brand new car direct from SCCA Enterprises, they are delivered as a kit that you can assembly yourself or you have it built at a Customer Service Representative (CSR). A brand new car will be a Gen3 and will run ~$45k depending on options, freight and whether you assemble it yourself or not. You can also buy a kit to upgrade a used Spec Racer Ford to a Gen3 it costs ~$14.5k and takes approximately 40 hours to install. Factor in a shop rate of ~$100 per hour if you have a CSR or performance shop do the install. Recently upgraded used Gen3 cars are generally running from $30k to $40k depending on the data system and spares. A used Spec Racer Ford (Gen2) can cost from $10-15k depending on condition of the car and spares. A car that needs repairs, bodywork or items like new belts, fire bottle, fuel cell, master cylinder, driveshafts or brakes, will generally be cheaper. Spares such as a quick jack, jack stands, engine, transmission, uprights, rockers and extra wheels can add a lot of value. Data systems built into the car can also add extra value as they are quite expensive especially with a digital dash, pressure transducers and other telemetry sensors. Used cars are generally listed in the Spec Racer forum, your local SCCA region newsletter, in SCCA's SportsCar magazine or available at a CSR. Other costs to consider are maintenance items for the race car similar to your normal street car you have to do maintenance to keep it running. Although you don't put a lot of miles on a car during a racing weekend the higher speeds, hard cornering and extra loads from sticky tyres put more stress, wear and tear on parts. The Spec Racer Ford is a relatively low maintenance race car but here are some common items to consider in your budget. Brake pads and rotors last about 3-4 weekends depending on the track and how many hard braking zones. You should bleed the brakes and top up the fluid throughout the weekend as the pads wear down and the piston move out. A quart bottle of brake fluid should last you most of a season depending on how often you bleed and flush the system. I do a motor oil change every half season or 3-4 weekends. The transmission oil can last an entire season. I check the air filter throughout the weekend and if it gets dirty I change it just before qualifying. The air filter should normal last 3 weekends or a whole season before needing a change but depends on if you have any oil blow by (common on Gen2) or off track excursions that clog it up. The Gen3 uses a cleanable air filter that can be serviced. Spark plugs and wires don't often need changing but they can be a remedy for electrical issues or misfires, I recommend the Magnecore wires. Sometimes the PCV valve can fail but they are an easy replace. Check you rule book but SCCA requires that belts are replaced every 2 years for SFI-rated and FIA harnesses have an expiration date usually 5-years from manufacture. Belts cost anywhere from $300-$1000. I use Scroth Flexi 2 x 2 six-point hat use 2 inch shoulder belts that work well with my HANS device they are FIA belts and cost ~$450 plus shipping if you can't find them local. The shocks are good for several season but they can wear out. They are a sealed item so need to be sent to an SCCA Enterprises approved rebuilder. Prices are based on the last time I had my Penskes rebuilt. A gearbox rebuild will run ~$2500 and needs to be done by approved SCCA Enterprise vendor with seals. The gearboxes can last a long time on the Spec Racer Ford depending on how they are treated on the track, with the right gear oil and seasonal gear oil replacement. The new Gen3 is showing more wear and tear on the gearbox with people experiencing shorter life. Removal and replacement will cost more, if you have to ship the gearbox there will also be the extra cost of freight. A engine rebuild will run ~$4500 and needs to be done by SCCA Enterprises with seals, plus the extra freight costs. The engine can last a long time, 4+ years, on the Spec Racer Ford Gen3 if treated well, regular filter and oil replacement about every 3 weekends. Removal and replacement will cost more if you are paying someone to do it for you. After 5 years the fuel cells can deteriorate and start leaking requiring a replacement. The fuel cells can be ordered through SCCA Enterprises and manufactured by Fuel Safe or ATL, they cost ~$1500 as a complete assembly plus freight. Suspension parts wear out with time and need to be replaced. You can either replace them as they wear out or as part of your annual maintenance program. Common items to replace are rod ends, wheel bearings, ball joints and tie rod ends. You might also need to replace the wheel hubs but less frequently, inspect them when replacing wheel bearings. Want more motorsports information, racing tips and technical articles, sign up for our Motorsports Newsletter. Thank you for subscribing! 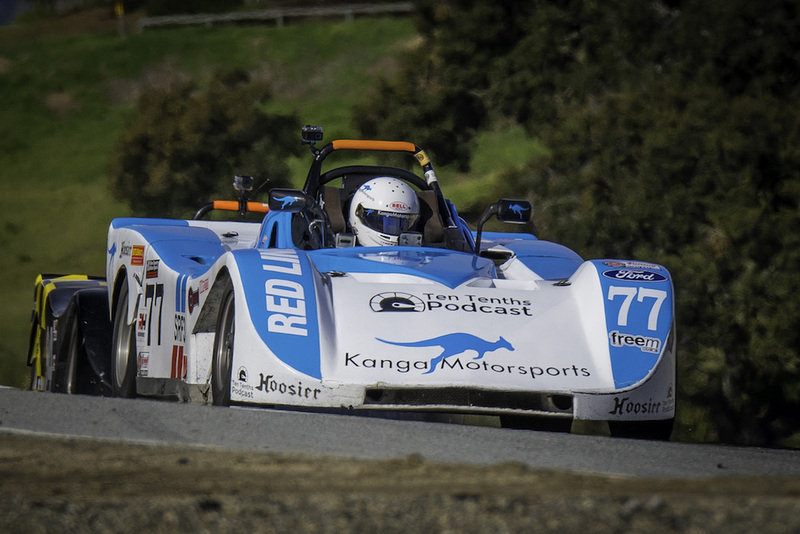 All the latest motorsports tips and news from Kanga Motorsports will be in your inbox shortly.